What can this Double Layer Organizer HOLD? 1 Inner pocket with 1 button enclosure for keeping some note book or some flat items. Portable Travel Organizer, EASY TO CARRY, lightweight and spacious design greatly for carrying everything you need when you are off to a short day trip or on a vacation. 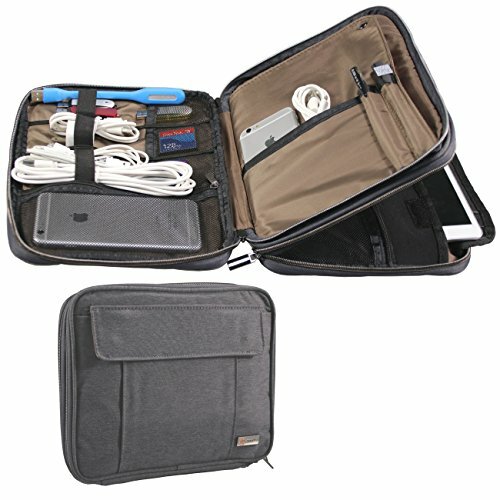 Perfect size easily fits into your briefcase, luggage, backpack. Multi-functional electronics accessories bag, also can be used as makeup bag and baby health-care grooming kit, great for storage and carry. Specifically designed for well organized people; Multiple mesh pockets and elastic loops provide great flexibility and keep your essentials well-organized. Waterproof Design: Electronics organizer bag made of durable and waterproof nylon with well padded semi-flexible covers protect your gadgets from accidental splashes of water. If you have any questions about this product by Q-smile, contact us by completing and submitting the form below. If you are looking for a specif part number, please include it with your message.